This week on Fieldstone Common our featured guest is Dr. Thomas W. Jones, CG, FASG, the author of the book Mastering Genealogical Proof. Thomas W. Jones is an award-winning genealogical researcher, author, editor, and educator. He has co-edited the National Genealogical Society Quarterly since 2002, and he is the author of Mastering Genealogical Proof. Certified by the Board for Certification of Genealogists since 1994, Tom serves the board as a trustee and is a past president. 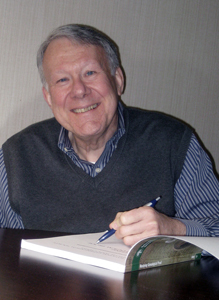 He is the 2011 recipient of the Association of Professional Genealogists’ Professional Achievement Award, 2004 recipient of its Grahame T. Smallwood Jr. Award of Merit, and 1997 and 2002 winner of the National Genealogical Society Award for Excellence for scholarly articles in the NGS Quarterly. Tom also is a professor emeritus at Gallaudet University in Washington, D.C.
Tom teaches in Boston University’s Genealogical Research Certificate program, online and in the classroom. He coordinates week-long courses at the British Institute, the Genealogical Research Institute of Pittsburgh, the Salt Lake Institute of Genealogy, and Samford University’s Institute on Genealogy and Historical Research. Tom also conducts frequent seminars for state and local genealogical societies, nationally and internationally. His presentations focus on methods of genealogical research, reasoning, and problem solving. Personal and professional genealogical research since 1963 has taken Tom to records of all states east of the Mississippi and four western states. His experience includes on-site research in courthouses, libraries, and archives in most of those states, the Family History Library, and other major genealogical repositories. He also has conducted research in records of France, Germany, Italy, and Ireland, and on-site research in Ireland. Paperback; 178 pages with 2 appendices, a glossary, a reading and source list and answers to the exercises. 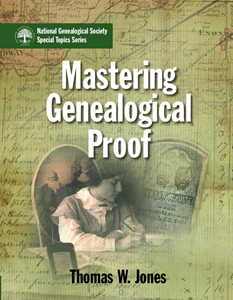 Mastering Genealogical Proof is available for purchase from the National Genealogical Society website . Tom and I dive into the various aspects of the Genealogical Proof Standard. Tom provides examples about how to formulate questions, the process of analysis and correlation and what to do when there are evidence conflicts. He even discusses how to approach citations so they are not so scary! One copy of Mastering Genealogical Proof was given out to the Fieldstone Common audience courtesy of the National Genealogical Society. Congratulations to our winner and thanks to the National Genealogical Society for their generosity in donating the book! Question: What’s that’s new stuff in the Fieldstone Common title (FC 86)? Answer: That makes it easier, especially for iTunes and other podcast listeners, to keep track of which episode they are listening to. FC stands for Fieldstone Common and 86 is the number of the episode. This entry was posted in Genealogy, National Genealogical Society and tagged genealogy, Mastering Genealogical Proof, Thomas W. Jones by FieldstoneCommon. Bookmark the permalink. Thank you – Thank you – Thank you! All the way from Australia my sincere thanks.